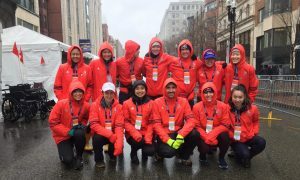 Last month, I traveled to Boston to immerse myself in marathon weekend festivities to get inspired. This time of the year is when the entire city of Boston comes together to celebrate a global field of remarkable athletes who have put in years and miles of hard work. The experience was awe-inspiring and everywhere I looked was a beautiful display of camaraderie. Here’s a recap of how the trip went down. I was especially excited that the 5K is held during marathon weekend and used this opportunity to get inspired in the city that hosts the most iconic marathon in the world. I also signed up to volunteer at the Boston Marathon finish line since many teammates were racing it. 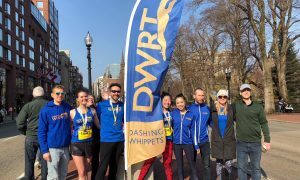 Plus, the Dashing Whippets has a Boston chapter – another great excuse to visit Boston and meet my amazing teammates! 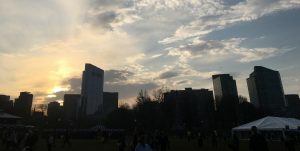 The morning of the race was beautiful: no wind, 52 degrees, and sunny. I rode into Boston the night before with four Whippet friends (Nick, Noel, and June) and we carbed up with lots of Japanese rice balls (except I was the only one racing). Apparently, the BAA 5K is the fastest course for this distance so I went in with the intention to chase a PR. 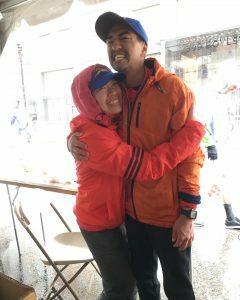 Before the race, I found Aaron, a former SUA teammate who came all the way from Southern California to race the Boston Marathon! Getting into the corrals before the race was nothing like the New York Road Runners (NYRR) experience, which I took for granted. Even though I submitted my anticipated finishing time during registration, I wasn’t assigned a corral. Runners were expected to follow the honesty system and place ourselves in corrals based on pace. I was in the 7:00 – 7:59/mile group but my pack was definitely going at 10:30. From the get go, I was aggressive about passing people. Unfortunately, it was extremely crowded so I had difficulty taking advantage of what this course had to offer: flat and few turns (making it easier to avoid adding unnecessary distance). Halfway into the race, I abandoned my goal of PRing and focused on hitting negative splits and finishing strong. At the very least, I wanted to run it faster than my college PR of 24:24. This race goes through the iconic Boston Marathon finish line and it felt great to dash through it! With 1,200 meters left to go, muscle memory kicked in and I started sprinting. It hurt – but how else am I supposed to close out a race? I couldn’t breathe properly, which is what makes the 5K so thrilling to me. I chased the person in front of me until I fell apart through the finish. My time was 24:09, 14 seconds slower than my 5K PR from the Jingle Bell Jog last year (23:55), but 15 seconds faster than my college best! I spent the rest of the day with my teammates (both Whippets and Aaron from Soka) and we stuffed ourselves with food, explored the crooks and crevices of what Boston has to offer, and checked out the Boston Marathon expo. It’s always delightful to spend time with teammates but it’s especially great when we are together outside of our normal context in New York City. We walked quite a bit, met up with more Whippets and ended the night with Thai dinner and drinks. 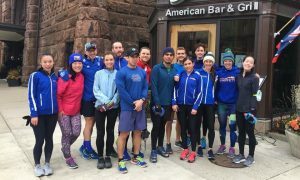 Sunday morning started out with a great shakeout run for marathoners with our Whippet friends in the Boston chapter. My legs were heavy from the 5K race and walking all around town from the day before but the company was wonderful. The “easy” 3-mile run was followed by brunch with the team. After stuffing ourselves, we went back to our Airbnb, showered, slept, slumped, and gave ourselves a nice, lazy day. The morning of the marathon was the furthest thing from ideal. I was excited for the Whippet marathoners (especially for first-timers) but felt anxiety for them too. It was 38 degrees with strong winds and torrential rain. I’ve previously complained about the Staten Island Half of 2016, something that still haunts me today. But Boston Marathon 2018 was nothing to mess with. I dreaded volunteering and wish I didn’t sign up but I pulled myself together because I made the commitment to support the marathoners. I checked in at the volunteer table with my Whippet friends and we were directed to the gear check area. Luckily for us, we were under a tent for the duration of our shift but the chaos that was to follow wasn’t delightful in any way. The first finishers were starting to come by to pick up their bags and every single runner looked miserable. Most of them were uncontrollably shivering. None of them were fully functioning, both physically and mentally and all I could think about was to get their bags back to them as soon as possible. With little to no space for these runners to change, they started taking over our tents to get out of their cold clothes. After finding their bags, I helped them take off their socks (among other articles of wet and cold clothing), call family members (since their fingers were numb), and transfer body heat through stranger hugs. Typically, runners aren’t allowed to change in the tents and one even went as far to decline runners from coming in because there are people’s personal things. But after completing a marathon in torrential rain and being overcome with hypothermia, rummaging through others’ personal properties is the last thing they’d do. The tents got more and more crowded as the mass of runners finished. It was incredibly challenging to keep up with a demanding crowd of freezing runners. I had to disappoint a few of them when I couldn’t find their bags after looking through every box and send them to the main tent. It felt like the rush and chaos would never end. My Whippet friends and I did the best we could to get each person’s bag back to them as soon as possible. I know how dreadful every second feels like after completing a race in awful weather conditions. At one point, I needed a drink of water pretty badly and had to use the restrooms. But knowing that the runners were in a much more desperate situation than I was and not enough volunteers to handle the demand, I put my needs aside to give them the best finisher’s experience I could provide. There was a lot of diving into boxes to look for bags and yelling out names and numbers but eventually, hours later, the hectic mess finally calmed down. We cleaned up the area as final runners came in and headed to the Whippets post-race hangout spot. Hours later, we were on a bus back to New York City to close out the trip. I learned later on that Desiree Linden had won the race after calling it nearly quits and becoming the first woman in 33 years to take the title as champion. On the men’s side, Yuki Kawauchi, a serial marathoner from Japan won, making him the first Japanese man to claim the title in 31 years. It was both of their first major marathon wins. Each of their stories display remarkable courage and determination and I hope to represent even a fraction of what they are capable of. 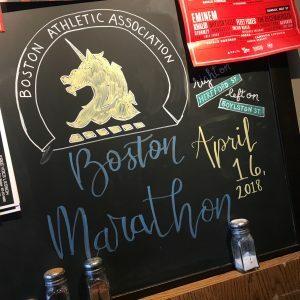 Even before completing my first full marathon last November, I gave myself a goal to qualify for the Boston Marathon. It’s a scary goal – I find myself asking every day, “Can I do it?” For my age and gender, I would have to run a full marathon in 3:35:00 in order to be considered (though, it would have to be closer to 3:30). Recent accomplishments like my surprising sub-1:50 half marathon finish make me believe I could. But there are days I struggle with it too. Running is a funny thing. What I learned from this trip is that it will take a lot of consistent effort to get to the starting line. But the thing about the Boston Marathon is that it will take a lot of resilience to cross the finish. What I witness on marathon morning was incredible. I can’t begin to understand the guts it took to tackle the race in the circumstances presented (and to even PR!). Congratulations to all the finishers! One day, I’ll join you there. It might take me tens of thousands of miles and countless years but I will be there!